WEEK 10 - BLOG CHALLENGE - Eggplant! Eggplant is also known as aubergine, a garden egg or a guinea squash. Most people are familiar with the purple 'egg-like' plant, but eggplants come in a variety of sizes and colours from long and thin to white and green in colour. Eating eggplant will give you 10% of your daily fiber as well as vitamin C, iron, magnesium and potassium. The skin of an eggplant is loaded with flavoniods (a plant pigment) that fight free radicals. The rich purple colour is due to anthocyanins which is a compound in flavonoids that gives it a deep purple colour. Flavonoids come in a variety of colours (red, purple or blue) and it is the reason why we should eat from a rainbow of colours. Clinical studies have found that increasing your intake of anthocyanins will lower your blood pressure and reduce your risk of cardiovascular disease. The high fibre content of eggplants, make them a great choice for weight management since fiber helps to satiet you and add necessary bulk to your elimination system. Fiber is necessary for good colon health as it feeds the gut flora necessary for healthy digestion. I will admit - I am more in love with the look of eggplant than I am about the taste of it, but I do enjoy it. The colour of eggplant (deep rich purple) is one of my favorite colours - it draws you in. It has a blue hue in the shadows and a warm pink/red hue in the highlights. It is so dark it almost reads black. The sheen of the plant creates strong highlights and who can resist the shape of it! So drawing the form was simple and fun. 1) Introduce eggplant into your diet this week. Use the recipe provided or find your own. 2) Since the eggplant is such a simple form, try drawing it! Find a colour that best matches it. Or if the colour really inspires you - add some rich purple to your wardrobe or home decor! The pictures below are such a fun and simple way to PLAY WITH YOUR FOOD! 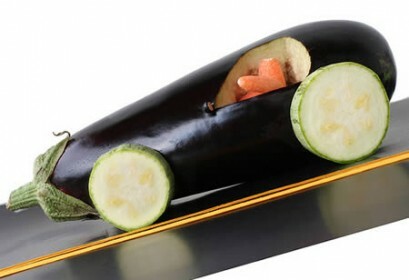 What creation can you slice your egg plant into? Take a photo of it and then enjoy a healthy and simple side dish. Remember this is suppose to be fun! Share your recipes on Facebook, or email them to me and I can share them too!